(Bloomberg) -- Oil inched toward the $70-a-barrel mark in London and then stumbled Wednesday, after a report showed U.S. crude supplies rising by the most since January and production reaching a record. After nearing its highest point in five months, benchmark Brent crude lost 0.1 percent as the Energy Information Administration report renewed questions about a global oversupply. The agency said crude stockpiles grew by 7.24 million barrels last week, topping analyst and industry estimates. While the numbers may have been skewed by shipping delays in Houston last week, the data nonetheless erased price gains earlier in the day that followed encouraging economic news from Europe and Asia, along with reports of progress in U.S.-China trade talks. “On the surface, the numbers look bearish with the big crude build," said Andrew Lebow, senior partner at New York consultant Commodity Research Group. “It tempers the market’s enthusiasm a little bit, although the variables may be more questionable this week." Brent for June settlement slipped 6 cents to settle at $69.31 on the ICE Futures Europe exchange, after earlier moving as high as $69.96. The global benchmark crude’s premium over West Texas Intermediate was $6.79 a barrel for the same month. WTI for May delivery fell 12 cents to $62.46 a barrel on the New York Mercantile Exchange. The contract had added 5.4 percent over the previous three sessions. 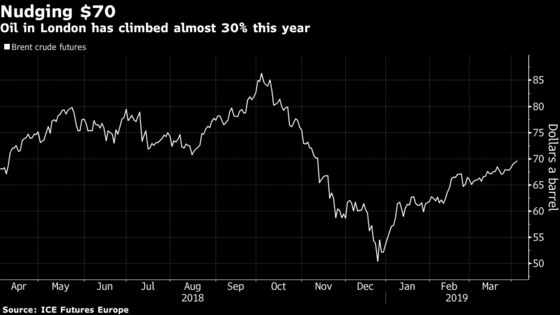 Crude’s rebound this year -- including the biggest quarterly gain in almost a decade -- has been a victory for the production cuts orchestrated by OPEC and its allies. Still, by fighting the re-emergence of a glut, the group has stoked the ire of President Donald Trump and heightened the risk of legal reprisals in the U.S. Rising prices may also influence White House decision-making on sanctions against cartel members Iran and Venezuela. The EIA brought another reminder of the U.S. oil boom that’s forced OPEC to intervene to prop up prices. American production hit a record 12.2 million barrels a day last week, the agency estimated. Gasoline and distillate supplies both fell more than predicted, alleviating some worries about demand. Also boosting the market were impending trade negotiations between Chinese Vice Premier Liu He and his U.S. counterparts, set to resume in Washington on Wednesday. Officials from the two countries have resolved most of their issues but are still haggling over enforcement, the Financial Times reported. Gasoline futures added 1.2 percent to $1.9512 a gallon. The sharp rise in Canadian heavy crude prices may finally falter this year, when swelling output overwhelms the pipeline system, according to Deloitte.